I had some left over footage from out trip, or non-trip to Jeju. I filmed the toilet bit just before we started back to Seoul and really wanted to use the footage in the video, but couldn’t make it work. So my solution was to couple it with something else. I also wanted to try my hand at some other transitions, and thought this would be the perfect time to do so! The result was something fun and a little different. I love greasy, greasy french fries. They are the things that make me feel fantastic and provide that feeling inside that makes me warm all over. Ever since I first ventured out to Mr. Big this summer, I’ve been longing to return with Jo and tackle their King-sized burger. This weekend we finally did just that. We had made a fun day out of it as well. Our first stop was the jjimjilbang for a few hours of relaxation, which, I thought would be key to tackling such a huge burger. Then we walked over to the CGV and watched Inception. Then, it was finally time to walk down to Mr. Big. We ordered a side of potatoes and a couple of beers while we waited for the main feast. We arrived at the right time, since shortly after we placed our order, the restaurant filled up. Finally, with our mouths watering, our burger came! The regular size comes with four slices and the king size has six. Our host told us that this burger would feed 4 people. I’m not sure how, but hey, we weren’t interested in that. We wanted to chow down… and that’s just what we did. 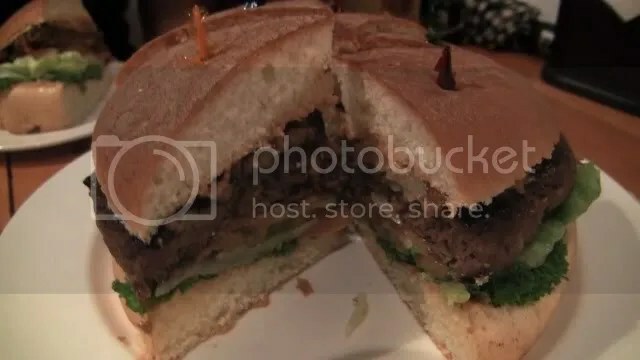 When all was said and done, we finished our potatoes and Jo and I almost were able to to complete the burger (remember, not everything you see on TV is real). I’ve had a lot of burgers over the years, and I still think that this is really one of the best I’ve every had. If you’re in Korea and want to really enjoy a great burger (I highly recommend the TG Burger), head over to Mr. Big and you won’t be disappointed. Just be prepared to really sing your teeth into something that will take a while to consume… and bring someone to help you! I love noodles. In fact, almost on a daily basis I consume a package of ramyun for lunch. Most of the time I dump in a cup of rice and add some meat, but every now and again, I’ll just have the noodles. One of the things I love about Korean ramyun, is that it’s full of spicy flavor. I often joke that there’s hot and really hot flavors. For the most part, that’s accurate, since there’s no really assorted styles like they have back home. Dongmin and Myungsup, two friends I met at a World Cup Match, told me there was some really spicy ramyun out there. I was doubtful, since I’ve tried most everything spicy here in Korea, and haven’t found it such. But after having a recent dinner with them, they showed me what they meant and I purchased a 5-pack. The ramyun is indeed spicy. In fact, it’s damn spicy. It’s probably the hottest thing I’ve had in Korea to date. As I was eating the noodles and gulping the broth, I kept drinking lots and lots of water. All-in-all, I finished it, but also spent the next hour peeing like there was a fire nearby. I got a picture from the rafting trip! Check it out! Saturday came around and I was puzzled as to what to do. I had originally planned on heading out to the East Sea for a little adventure, but the forecast called for rain, and I really had no desire to sit on a bus for three hours and then get rained out. So I turned my attention to Dongtan! What to do on a rainy day: Screen Golf. It had been almost a year since I last went for an outing at our local place. I had originally planned on playing nine holes. However, I was in rare form and was knocking the ball a good 220 yards on the tee-off. Even my fairway blasts were good. However, once I got on the green, things went downhill… and fast. I really need to spend more time there practicing putting, because in relation to everything else in the game, it’s far more difficult. Since the screen has hills, valleys, and everything you’d expect on a golf course, putting on a flat surface takes some time to get used to. As a result, I two-or-three-putted everything! I did manage to salvage some holes: (I parred four and birdied one). After doing a little shopping in town, I popped over to a restaurant Jo and I discovered on one of our walks around town: Mister Big (미스터빅). It’s a hamburger joint. I never really understood the name, but thought it was pretty cool. While the menu is in Korean, there are a few things that are in English, namely the sizes of the burgers: Single, Regular, and Giant. I opted for the regular size. It was huge, as you can tell from the picture. I really wasn’t expecting something like that. I thought it would be something like a one-pound burger. BUT NO!!!!!!!!!! It was freaking huge… and delicious. I am really looking forward to taking Jo back there and getting the giant size. One of the nice things about the place, is that they have W2900 500cc beers. Oh, and they deliver!!!! After the meal, I went to my local Home Plus. There I picked up an adult beverage for the night. I decided on trying something new, and seeing how there was nothing special in the beer section, I opted to start looking in the liquor area. 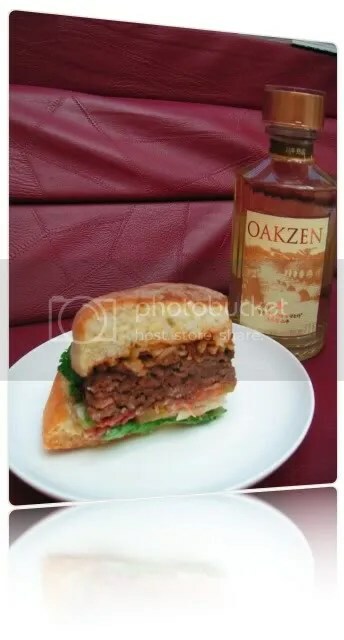 Something captured my eye, a bottle in the soju section: OAKZEN. My 한글 (Korean) is pretty bad, but I could tell that it was special: the soju was aged 10 years and in oak caskets. The result was an amazing blend of soju and oak. In fact, it tasted almost like a weak scotch. The alcohol content was also a bit higher than normal (25%). Sunday afternoon I left the apartment on a mission: to find some hooks for out kitchen. The bar that has holding up all our spatulas and rice paddles has finally bit the dust. The left suction cup just won’t stick! It’ s a very sad thing, as Jo and I have relied heavily on it for cooking! 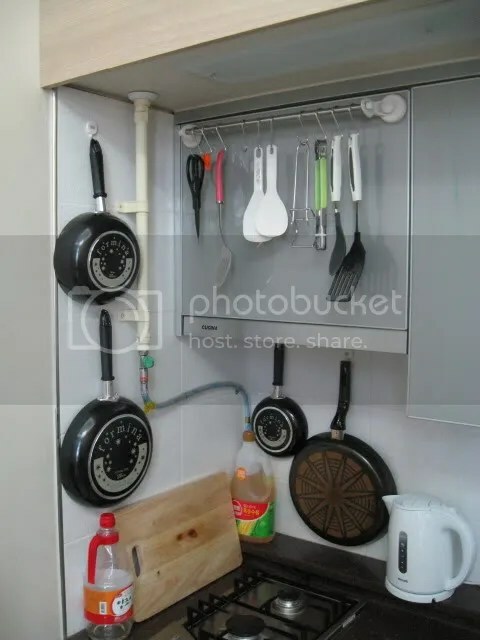 For the past week, we’ve had these utensils hanging all over the place, and it was starting to get to me, since I like a nice an tidy kitchen. Luckily, on my trip to Daiso (a 1000 won chain store), I found two door hooks. While they are designed to hang over your closet door and for you to put your coat or jacket on… these hooks just happen to be the right size to hold the long bar that keeps falling down. As a result… our problem has now been solved! Following this successful shopping journey, I went out to E-Mart to pick up some nachos for later. While there, I saw that Chivas was on sale. It’s been a while since I’ve had some scotch in the apartment. I mean, I love soju, but having a small glass of scotch is a great way to sit down and relax with Jo at the end of the weekend. What I didn’t anticipate was a little problem when I got home. 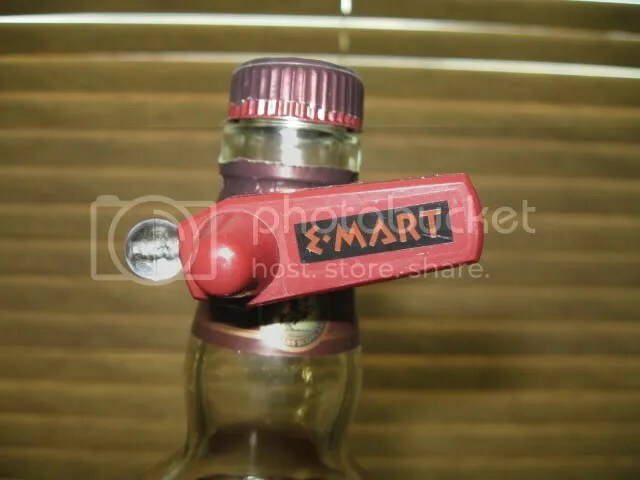 I opened up the box of Chivas to find that E-Mart had installed a security ribbon on the bottle. These are metal and can’t be cut. They must be removed at the cashier. Mine failed to open the box and remove it… But that didn’t seem to matter, since I walked out of E-Mart with no alarms going off. I guess these are just for show. I’m just glad they aren’t the once that cover the spout of the bottle. It makes it a little harder to pour… but the W3,000 I saved has made this bottle a welcomed treat. I plan on having a little this evening as Jo and I watch the Season Finale of The Amazing Race. Something else that Jo and I have been hooked on lately has been Castle. We watched the entire first season last week and have already digested the first episode of season two. We might hold off until the second season completes so we can get a single set of all the episodes. Sunday night, we resumed our tradition of having Pizza. Rather than walking all the way to Pizza Maru, a new placed opened up near Central Park: YoungGu’s! I really like their style, although they are a bit more expensive. But for W19,000 Jo and I got a great combination pizza (18 inches at that) and a cola delivered to our apartment. I’m not sure if this will be the weekly replacement for Pizza Maru (W12,000 for two mediums), but I will admit, I really do like not having to walk to the shop (since Pizza Maru doesn’t deliver). For those interested, here’s the video of our Saturday outing. I’m quite happy with the final result. One of our last few Saturdays rolled around this weekend (before our vacation) and Jo and I were trying to decide what to do. Luckily, my friend Hyunwoo sent me a text message on Friday letting me know of a culinary festival in Yangjae. Just what was this festival??? 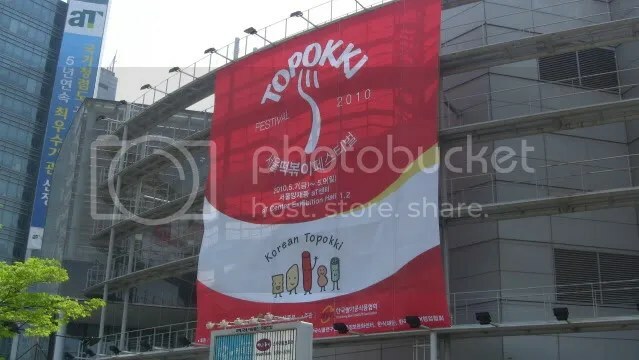 It was the 2010 Topokki Festival. Don’t recognize Topokki? May you will if I write it as tteokbokki! No matter how it’s romaized, it’s still 똑볶이! The purpose of the festival is to highlight some of the new and amazing dishes people are making. The Korean Culinary Institute is making the push for topokki to be the next major exported food from Korea. The entrance fee was W2,000 and that got you into two exhibit halls. The lower level was by far the best, since it had all the food. 😉 I didn’t even get a chance to fully enter the floor area before being stopped by two university students that were conducting interviews with foreigners. It was a grand experience and I was finally able to introduce to Jo my favorite Korean food. We tried the traditional Topokki, listened to the Topokki song (several times) and then found one of our favorite new styles of this Korean delicacy: a spaghetti based topokki dish. Words cannot describe how awesome it was. I mean, it was sooo tasty! It had everything: beef, vegetables, spaghetti, sauce, tteok, and a little spice! 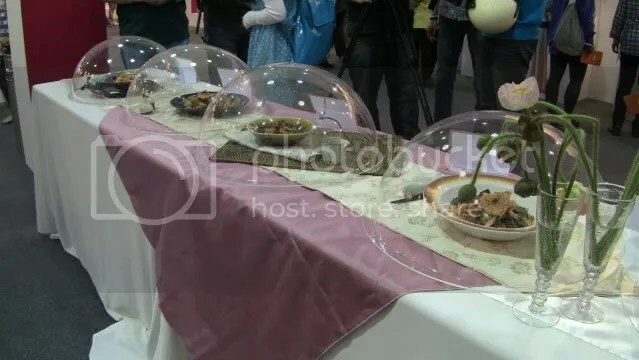 The second floor of the exhibition was devoted to products one uses when making this delicious treat. I didn’t find it all that interesting, but one thing that was fantastic was a small tteok filled with either chocolate or cheese. All during the exhibition, Jo kept on saying that they should develop a hollow tteok and then fill it with some sort of stuffing! Low and behold, we found it! The chocolate was great, but the cheese filling was even better! 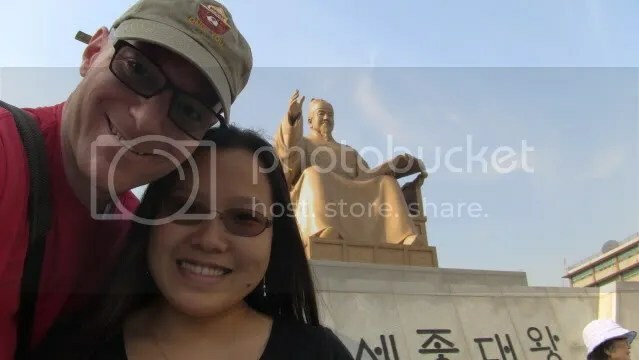 After the festival, Jo and I hopped on the 470 and went back to Gwanghwamun (it really seems to be our favorite area of Seoul). The purpose of this visit was to check out the King Sejong museum. I’ve been before and found it quite interesting. There are several entrances, but my favorite is the one right underneath the Sejong Statue. The museum is free (yay!) and has everything in English and Korean. Foreigners can also rent (for free) an mp3 player that explains each stop along the way. While there, Jo and I also discovered the Admiral Yi museum… this of course will require another trip back to the plaza (oh shucks… twist my arm). During this trip, I hope to finally take Jo to Gyeongbok Palace! So there was our Saturday! Sunday we remained in Dongtan to take care of several housecleaning items (like laundry). Overall, this was one of our best and favorite weekends in Korea. For those in Korea, if you can find a copy of Speakeasy Magazine, you’ll see that Jo has three photos published in the May issue. Of all the photos submitted, hers were definitely the best (but, hey, I’m biased). I’m so proud that she is now a published photographer!